Newcastle manager Rafael Benitez has been fined £60,000 after accepting a charge for commenting about the referee prior to his team’s Premier League game against Crystal Palace last month. Benitez was responding to Palace forward Wilfried Zaha, who had said he was not being protected by referees. The Spaniard said he had “a lot of confidence” in referee Andre Marriner. The Football Association constituted the comments as improper conduct and/or bringing the game into disrepute. FA rules state managers are not allowed to talk about specific referees prior to a game. 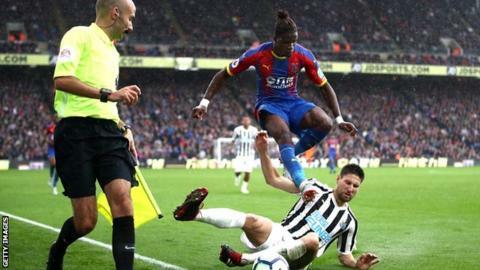 Zaha had said he believed that he would need to have his leg broken before opponents were show a red card. Benitez responded: “I am surprised because normally the FA deal with these comments. I have a lot of confidence with Andre Marriner. “He has a lot of experience, even if his record with our players is not that great in terms of red cards. He is an experienced referee. “Zaha is a good player, no doubt about that, but I think the FA have to deal with his comments. I think Andre Marriner will not have this in the back of his head.